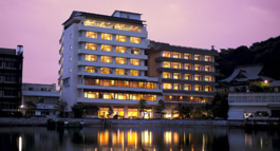 "Tokiwasure Kaikatei," located by the east coast of Lake Hamana in the western part of Hamamatsu city, is a hot-spring hotel in Kanzanji Onsen. Not only can you enjoy our six different kinds of baths, and dishes prepared using Lake Hamana's seasonal ingredients, but when you arrive you will be treated with our welcome drink service, and kindly greeted with the seasonal flowers arranged by the hand of the owner who is a professional flower arranger.As the name suggests, you will forget about the flow of time of everyday life at this Japanese-style hotel where you can really relax. And, it is one of the rare hot-spring hotels to have an art museum, so you can also enjoy viewing amazing pieces of art from Japan's past. The deluxe suites have special outdoor hot springs. 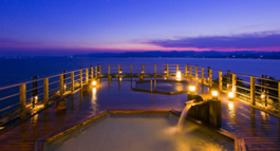 Lake Hamana can be seen from the outdoor hot springs, and you can enjoy a luxurious space all to yourself. "Hananoyu" has six kinds of baths that are of course available to guests staying with us, and to those just visiting us for the hot springs.You can slowly submerge yourself while enjoying tranquil moments in any of our baths, such as the outdoor hot spring that overflows with freedom and has a garden, the rainbow bath where the colors of the rainbow shine, the Japanese cypress bath, the lie-down bath where you can soak yourself while gazing at the clearly visible, starry sky, or the jacuzzi and sauna that both improve circulation. 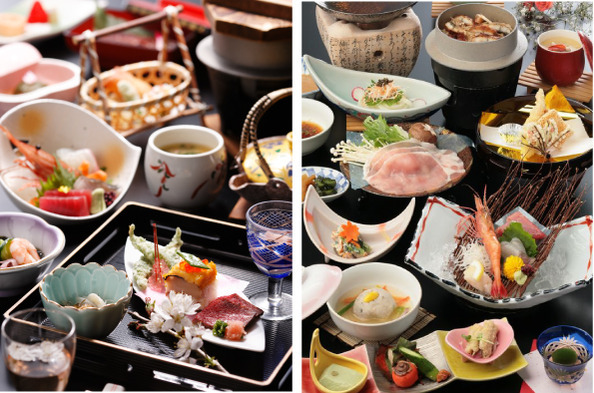 You can enjoy food made with Lake Hamana's seasonal ingredients, at "Hanakomichi," a restaurant located within the hotel, or "Sakurabana", which offers Japanese-style dining, or at the banquet hall. 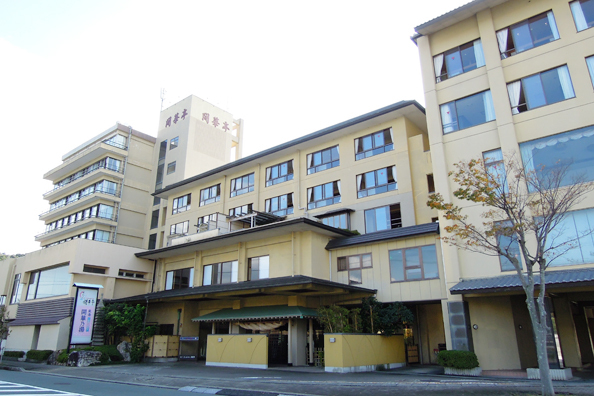 In addition, you can enjoy the "room service" style which is unique to Japanese-style hotels (a meal style where you eat dinner in your own room, meals are carried in gradually, and makes for a special experience), that is also in our lodging plan. The Japanese-style rooms overflow with a sense of freedom, and Lake Hamana can be clearly seen from both Japanese and Western-style rooms. The deluxe suite can be used by as many as nine people, and has a special outdoor bath with a clear view of Lake Hamana. 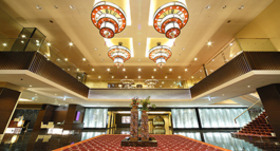 There is a welcome drink service in the open, cheerful lobby that faces the Japanese garden. You can select your favorite from a selection of colorfully designed yukata (for a fee). We can also help you with changing into them so do not worry. While wearing a yukata, you might enjoy taking a walk to see the shops offering Lake Hamana souvenirs, or the gardens. The Lake Hamana Kanzanji Art Museum adjacent to the hotel displays the hotel owner's precious possessions.The fine Japanese works from the Edo period, with a focus on masterpieces from the Tokugawa family, all of which are genuine, are worth a see. At the cafe gallery on the first floor, you can also enjoy a light meal while looking at art, in a nice area with a clear view of Lake Hamana. Limited to guests staying at Kanzanji-onsen affiliated hotels and inns, the itinerary of this free-and-easy bus tour conducted by local guides is changed every 2 weeks or so. Wouldn't you like to go on a 3-hour mini-tour around the various tourist attractions while being introduced to beautiful natural scenery for each season? Take the "Kanzanji Onsen" line bus (45 minutes ride) at bus stop #1 of the bus terminal to "Hamanako Palpal" then walk 1 minutes.